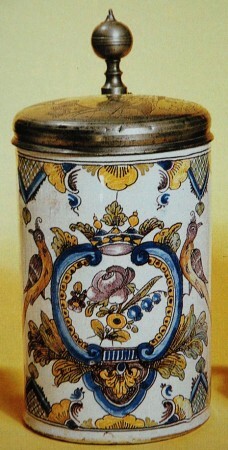 Hannoversch-Munden started producing faience in 1732 and continued until 1806. 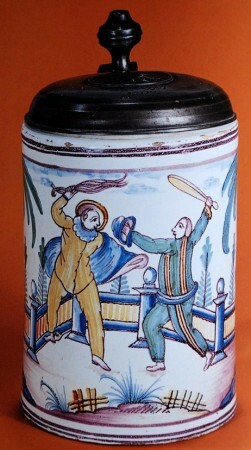 Very little is written about this factory and while they made some quality faience pieces, most of the steins produced were not elaborately decorated. 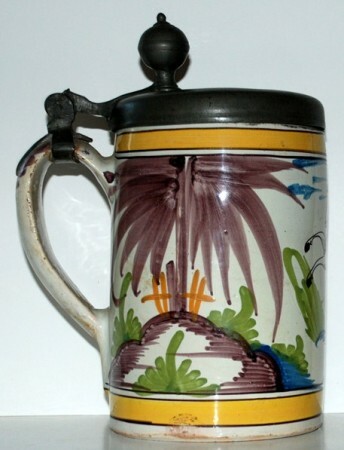 As a matter of fact, three designs dominated the decoration that appears on their steins and will be highlighted later in this article. 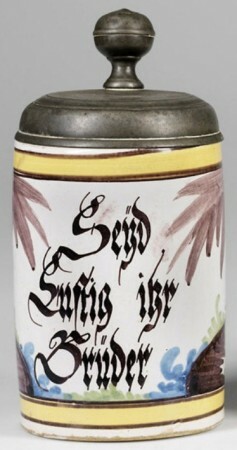 The stein body on a Hannoversch-Munden piece can best be described as squat. 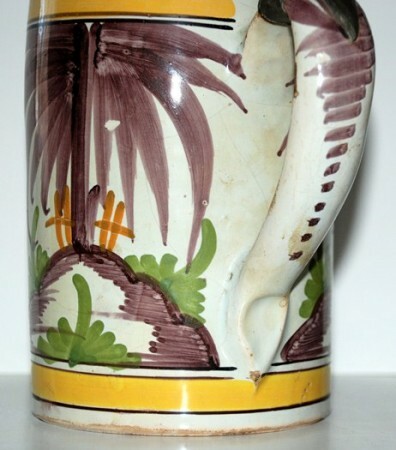 It is shorter than most faience steins (6 inches or less) and wider than most faience stein at 4.5 inches or more, thus giving the squat appearance. This shape helps in identifying this factory. 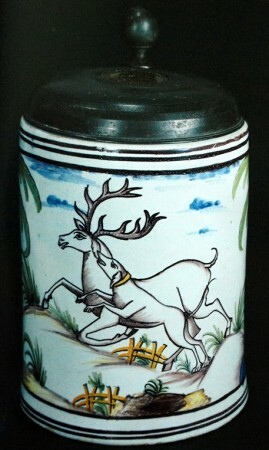 The body is indented at the top and has a straight side at the bottom, typical of northern faience factories. 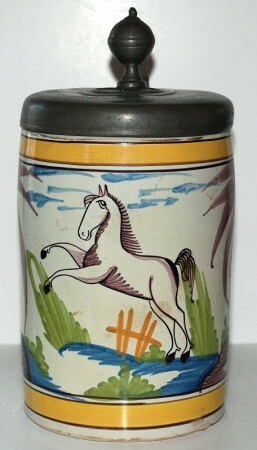 Figure 1 shows a typical Hannoversch-Munden stein. 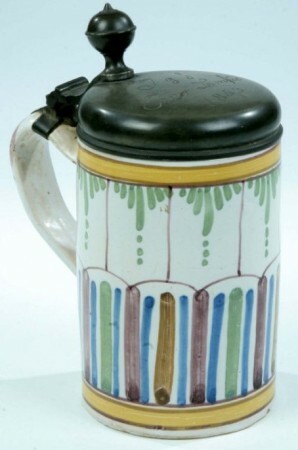 Due to the squat body, the stein handle is attached near the top and the bottom of the stein. Figure 2 shows a side view of a handle. 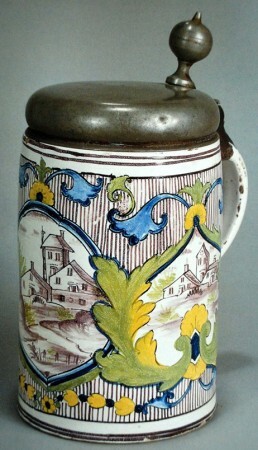 Note how the upper handle attachment rises up from the stein body. The handle has a flattened D cross-section and is usually taped from top to bottom. The bottom handle attachment ends in a point and is pushed in where the worker attaching the handle used their thumb in finishing the lower handle attachment. This lower handle attachment can be seen in Figure 3. The factory mark that can be found on some Hannoversch-Munden pieces is 3 C’s with or without a line under the C’s. 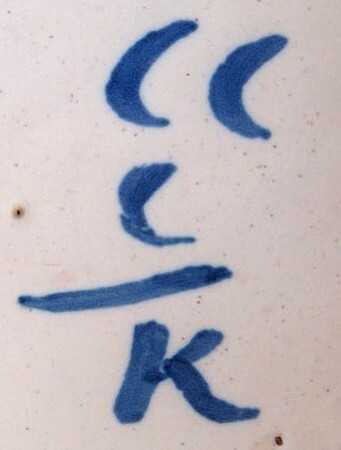 Figure 4 show a typical factory mark that can be found on some steins (the K is the decorator’s mark), but most pieces are not marked. 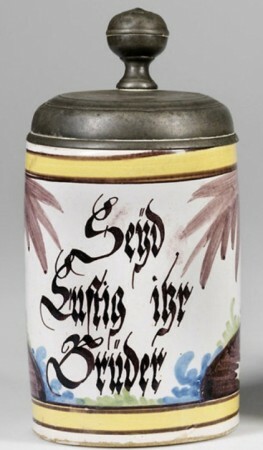 The pewter work on Hannoversch-Munden pieces is also unique in that you will usually only find a pewter lid. 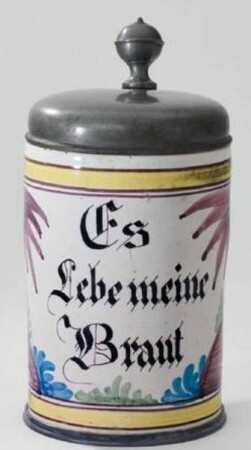 There is no lid ring at the top (which is usually found on northern factories) and there is no pewter at the base of the stein. (Figures 5 & 6) This is not a case of a missing pewter base, but I believe that most pieces did not have any pewter at the base of the stein. 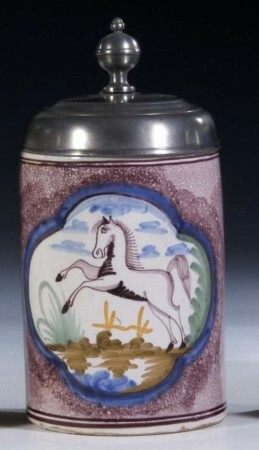 Also, the pewter lid often has a dome shape to it as can be seen on the stein in Figure 1. 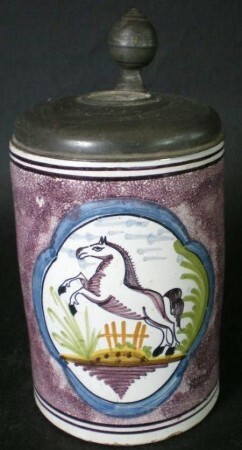 Three designs account for almost 90% of the decorations that appear on Hannoversch-Munden steins. These three designs are horses (44%), verses (36%) and abstract designs (9%). 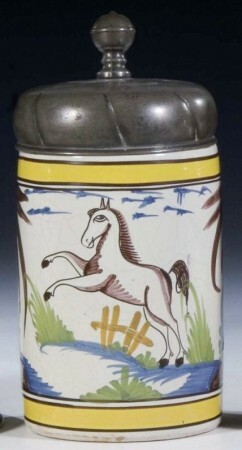 Figure 5 show a typical leaping horse that is seen on these pieces. 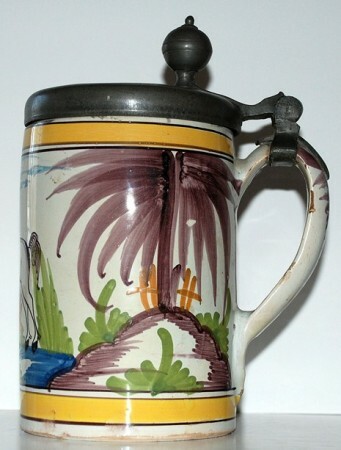 The sides of these steins usually have a palm tree, as can be seen in Figure 6. 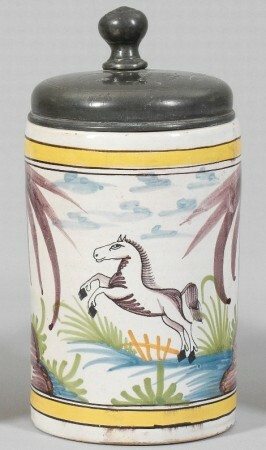 A typical verse stein is shown in Figure 7 (the sides of these steins typically have palm trees like the horse steins) and the abstract design is shown in Figure 8. “Jesus loves you” is always a good thing to hear…..unless you are in a Mexican jail!